As they say the best laid plans of men and mice often go astray. Click on picture to see photos of this day. On Thursday the day before we were to leave, the stereo system in the van began to act up. I rushed to the dealership at around 4 p.m. and asked if they could look at it and correct any faults. Alas I would have to wait until Friday morning at 7:30 a.m. for an appointment to run a diagnostic on the media player. It would take and hour and half. I had organized my start of the journey to Florida for Friday morning at 9 a.m. Now it most likely would be 10 or 10:30 a.m. As it turned out we didn’t depart until 11 a.m. only to find ourselves in a number of traffic jams before we even got to the 401. Add another delay to grab a bite to eat and it was noon before the hum of our tires on the 401 occurred. On the 401 the traffic was moderate but slower near the airport, Kitchener, and London but for the rest of journey we travelled at 10 to 15 km over the speed limit. Most of you have travelled the 401 mostly to Kitchener and sometimes further. As we approached Chatham I thought of my friend Barry Thompson who has moved down to this area to escape the big smoke. I didn’t call him to tell of our nearness for concern that he might inconvenience himself and come to the highway and wave as we went by. The road signage also had me thinking of the black communities that had grown up in this area before the Civil War. Places like Buxton and Blenheim. Uncle Tom’s cabin was in this area. As we travelled further I was surprised when we were about 50 km from Windsor. The signage became bilingual but then I remembered right from the start in this area there was a French community. The land is very flat and prairie like in this area. Flocks of crows can be seen quite often. What is even more evident is the wind farms with giant lumbering propellers slowly rotating and generating electricity. Dozens and dozens of them. We finally approached the border and cross uneventfully at the Ambassador Bridge. Once through customs another 1000 yards and then turning left we were on the I75 and heading for Florida. Time then 4:30 p.m. The sun was in its twilight and it was even darker because of the low hanging winter clouds. We kept going for another two hours. We stopped at Bowling Green Ohio and tried to book a room. Every hotel was full since there was a graduation being held on the weekend. We continued down the highway to Findlay and ended up in the Hampton Inn. When I compare the space and the amenities to that which we had in Paris, at double the price, it was no contest. The Hampton Inn won. I admit should you step outside in Findlay the world is one of gas stations, restaurants, furniture and gift stores, a Wal-Mart and strip malls. A typical American landscape and no contest to Paris. We were hungry and right next door was for Elizabeth a place she had always visited when travelling south, a combination gift shop and restaurant. It is called the Cracker Barrel and it looks like and feels like a large general store. 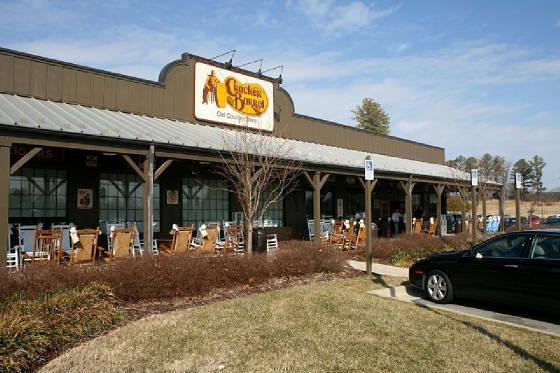 The façade is all barn board and the entire front of the store is a long porch and on it are 20 or more rocking chairs. The gift store part is chock a block with Christmas items and all the hokum stuff that your favourite Aunt would decorate her home with. Plaques with cute saying, a large carved rooster, Christmas plates, a treasure chest of varying candies. Cute dolls, battery driven toys and more. The restaurant itself is pleasant enough and the menu tempting. However everything is overcooked, under seasoned and quantity is given instead of quality. My turkey noodle soup had tasteless turkey, sodden noodles and incipit broth. The cat fish fingers that were breaded were more bread then catfish. However judging from the men’s and ladies football teams that were dining in twos and fours that didn’t matter. This was high dinning for most of them. Even the worst of the French restaurants that we dinned at in France there was usually some redeeming quality to the food. Ah America, ah middle America you are the nicest of people but the worst gourmets at any table. You eat anything that is put in front of you and don’t say boo just packing on the pounds with food that if fed to most of the starving others on this planet would kill them directly whereas with Americans it takes longer to die because of being overweight and all the problems that arise from that. And one more thing. The washrooms at Cracker Barrel, unlike in France, were clean, comfortable and modern. In France in a similar restaurant the John could be a hole in the floor, a toilet without a seat and toilet paper never available or at hand. After supper I wanted to buy a map, a good old fashion map. Others love their GPS but me, give me an old map that with one look I can see where I am and where I am going in a few seconds instead of fiddling with the screen programming and zooming in and out to figure where I am. I had left my map and the entire Florida file at home. I ground my teeth during the first day maddened by the thought I couldn’t find the dam file with the names, dates, insurance and research. Grrrrrrrr!!!!!!! It is now only 10 p.m. and Elizabeth is sound asleep across the room and my circadian rhythm will tell me to go to bed at 2 a.m. at the earliest and hence why I can write a blog and organize my pictures which I do to kill the time.